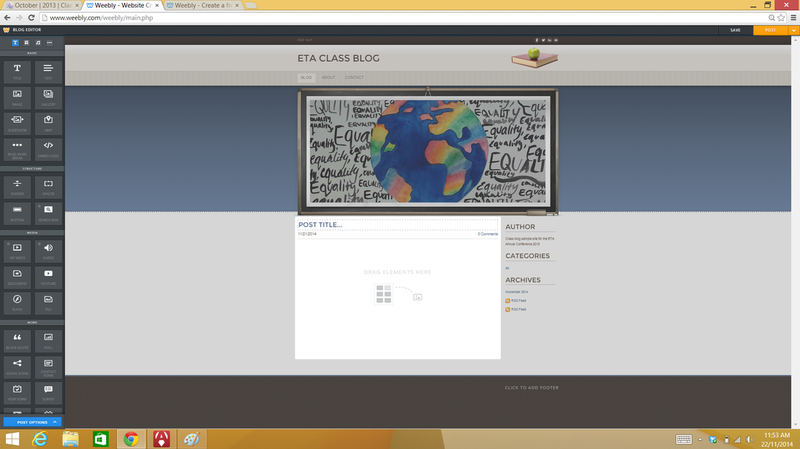 Here's a quick reference for teachers to set up a class blog using weebly.com. 1. Visit weebly.com and sign up. Choose “Blog” as the focus of your site. 2. 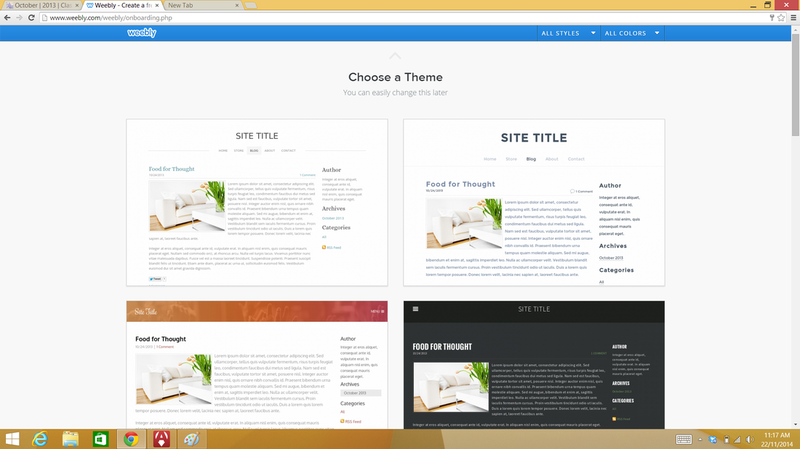 Choose a theme for your site (you will be prompted on the next page). 3. Choose your blog domain name. 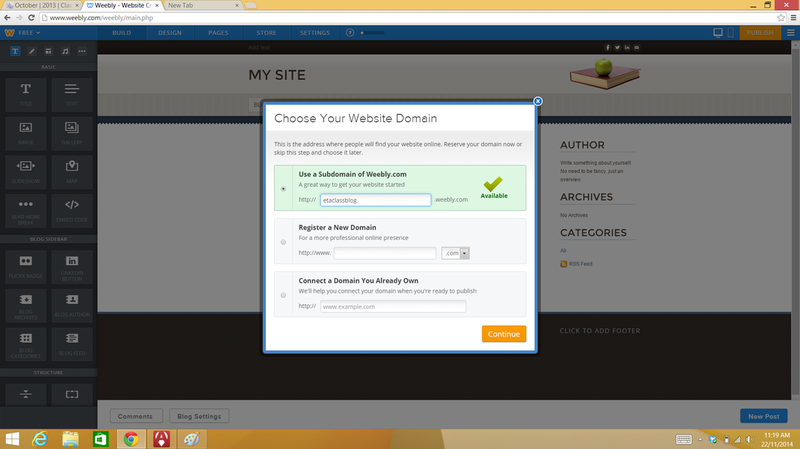 It is free to choose a weebly subdomain (eg etaclassblog.weebly.com). 5. 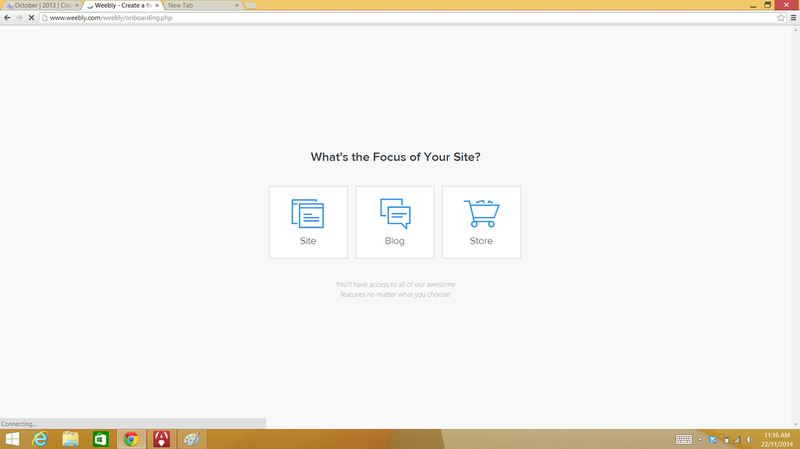 Work in the “Build” tab at the top to design your site by dragging elements from the left onto your site. 6. 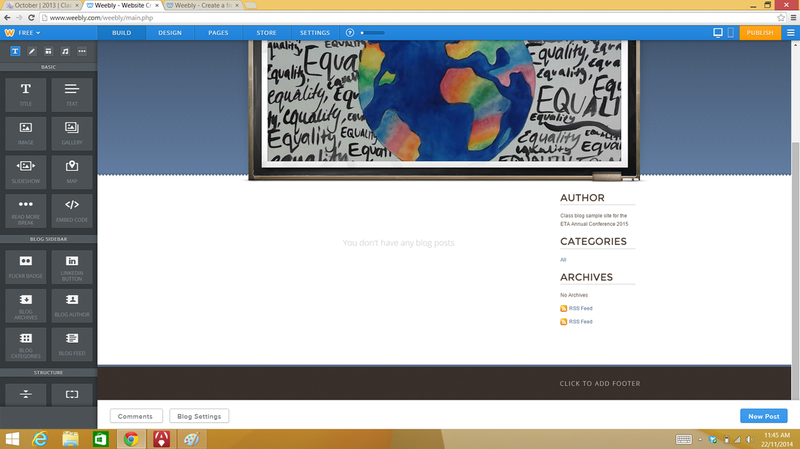 Use the “Pages” tab to add and edit pages on your blog site, which appear on the menu in your header. Create an “About” and/or “Contact” page, and add text, images, and more. Choose the layout and visibility of your site here. 7. 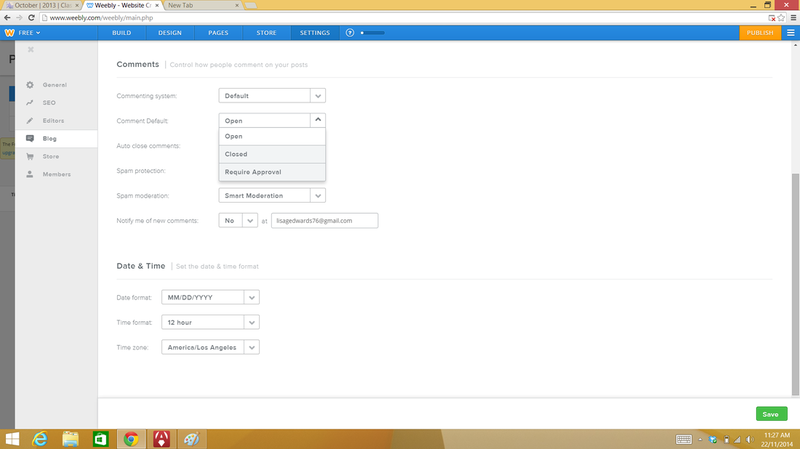 Use the “Settings” tab at the top to establish your commenting settings and spam filters. 8. When you are happy with the design of your site, click the orange “Publish” button at the top right of the site to publish your site to the Internet. 9. 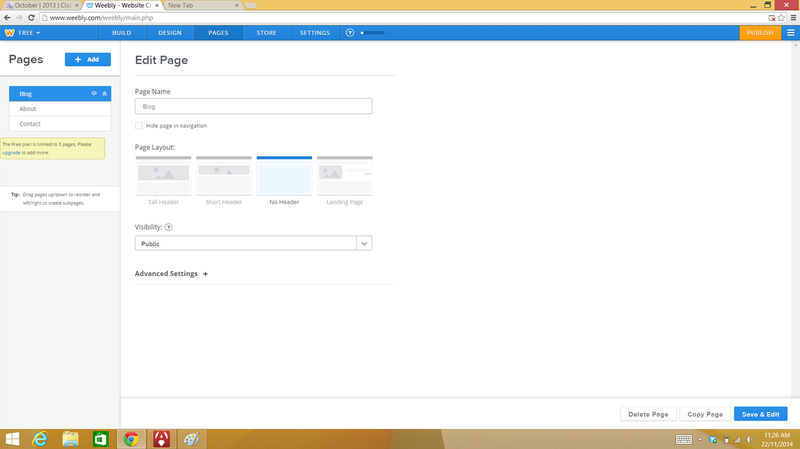 Create a new blog post by clicking on the blue “New Post” button at the bottom right hand side of the home page. 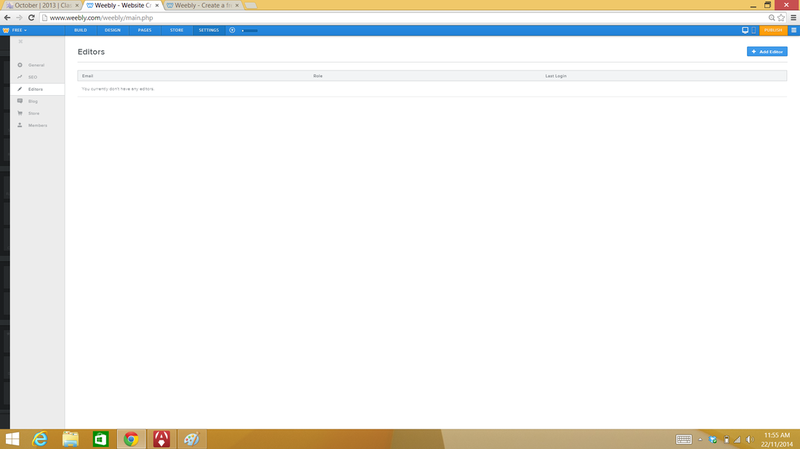 Add text boxes and media from the toolbar on left. Add your text and click the orange “Post” button at the top right when you are ready to publish your post. 10. In “Settings” select “Editors” to add editors to your blog site. Invite students with their email addresses. (Note: you will need to have the $99pa Pro version to do this.) Add editors using the blue button at the top right corner of the screen. 11. 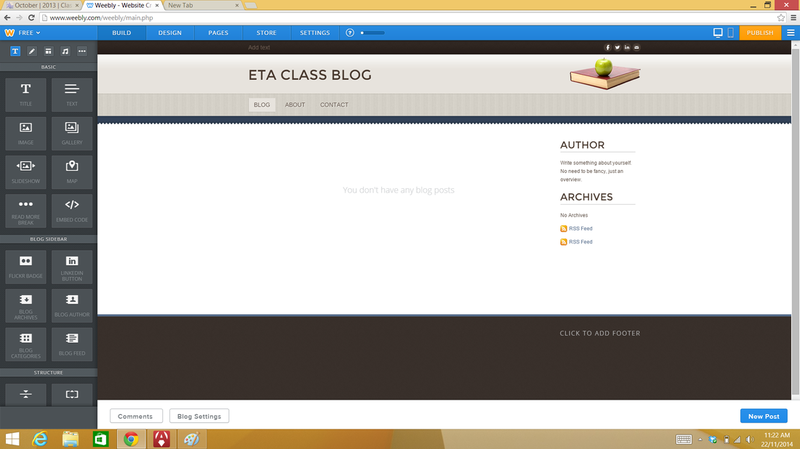 Students will receive email invitations, create logins and then be able to access the dashboard as “Authors” of the blog. It all comes back to the authenticity of learning experiences. Learning activities and assessment become more meaningful when students are addressing a real audience. Because students are writing in a medium that is published to the world, and are, in effect, educating that audience about what they know, not only are they more engaged, but their writing is better. They take more care. They proofread. And they THINK about what they are writing. Then we have the social aspect that is so central to blogging: creating a meaningful dialogue, giving positive feedback, exchanging ideas, even disagreeing, and, most importantly, engaging with what others have to say. 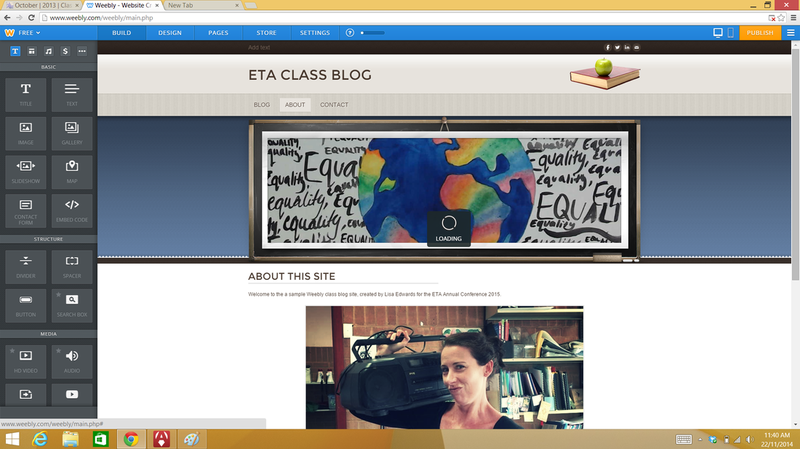 The blog provides us with endless possibilities as teachers.